Buy Gymnast design personal checks online. These Designer Checks cost the same price or less than what the bank would charge for regular generic checks. Gymnast Checks ~ 4 alternating images. Use discount code Save3 at checkout for $3.00 off each box ordered. Inspirational Gymnastics Checks ~ 4 different captions including "Strength", "Grace", "Style", and "Flair". Matching return address labels also available. 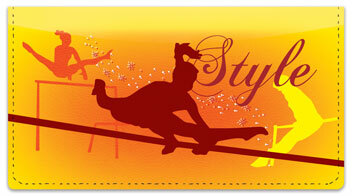 Gymastics Checkbook Cover ~ Full-color cover in your choice of cloth or leather. The perfect complement to your Gymnastics Personal Checks order. PersonalChecksUSA.com ~ over 9,000 unique personal check designs! DESIGN PERSONAL CHECKS custom printed with any photo.